Happy New Year!!! Have you made any resolutions for 2010? I'm not usually one for making a lot of resolutions at the beginning of a new year, but I've realized that as I get older, it seems like each year is going by quicker and quicker. I obviously can't slow down time, but I can take the time to live each day to the fullest and to enjoy the little things. So, this year, I'm going to try to follow Sabrina's lead and to "make the everyday magical". 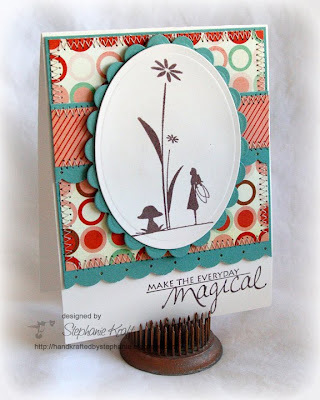 I used Mercy's Tuesday Sketch Challenge #54 for my layout and the November Unity Kit of the Month, Simply Magical. After stamping and die cutting my image, I sprayed it with Iridescent Gold Glimmer Mist so that it sparkles and shines in real life! I hope you have a wonderful and magical day and all the best in 2010! Thanks so much for stopping by! Accessories: Oval and Scalloped Oval Nestabilities (Spellbinders), Scallop Diamond border punch (EK Success), Iridescent Gold Glimmer Mist (Tattered Angels), Foam tape, Thread, Sewing machine. Beautiful card, Steph! LOVE your resolution!!! Beautiful card, Steph! Great take on Mercy's sketch! BEAUTIFUL! Lovin' the colors and your sewing! stephanie...this is simple wonderful! love the simple image with that GORGEOUS paper! lovely scallops and stitching as well, sister!